Akron-Canton Regional Foodbank staff members were excited to celebrate the opening of the LeBron James Family Foundation’s I PROMISE School on Monday. In partnership with the Foundation and Akron Public Schools, the Foodbank will be a part of the Family Resource Center within the school which will include a food pantry for families. The pantry, made available to school families, will be open two days each week and will be managed by Foodbank staff members. It was funded through grants and donations secured by the Foodbank from Keith and Linda Monda and Costco. This will be the first food pantry the Foodbank has managed and will be a learning experience. Carver Reed met with the Foundation about offering a food program within the school earlier this year. 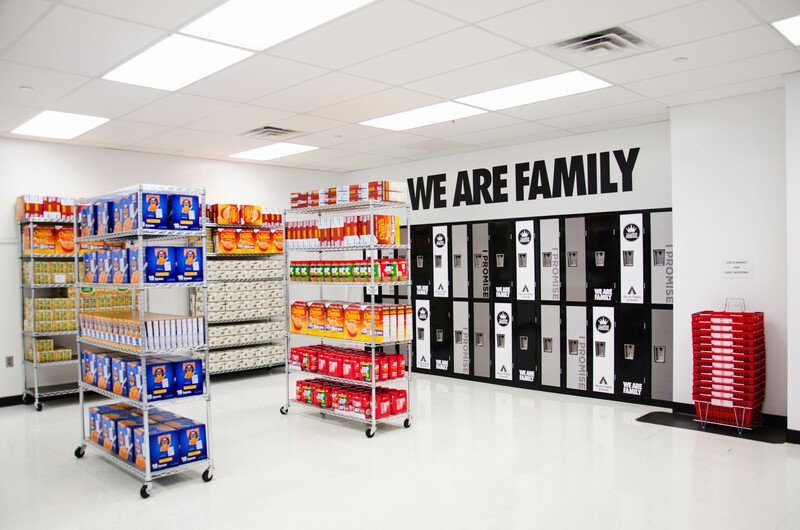 Together, they brainstormed the idea of a school pantry and the partnership has been a natural fit. The I PROMISE School Family Resource Center will offer many services in addition to the food pantry, including case management support services from Jobs & Family Services and General Education Diploma (GED) opportunities from Project Learn. Students attending the I PROMISE School qualify for the program based on socioeconomic and performance factors. The 2018 school year will serve students in third and fourth grades, though the school plans to serve students first through eighth grades by 2022. For more information on the I PROMISE School, visit lebronjamesfamilyfoundation.org. For more information about the Akron-Canton Regional Foodbank, visit akroncantonfoodbank.org.